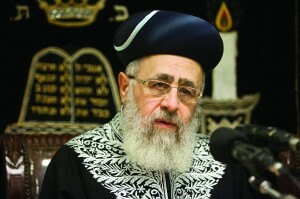 The Movement for Quality Government (MQG) on Tuesday, 5 Adar sent a letter to the Office of Rishon L’Tzion HaGaon HaRav Yitzchak Yosef Shlita, requesting that he refrain from making a planned visit to Netivot on the eve of the elections for the 20th Knesset. The rav is planning his first visit to the southern city next week, which the MQG feels will send a subliminal message to voters to back Shas in the election. The movement feels such a visit at this time would be illegal, and it is calling on the rav to postpone his visit. MQG officials explain the election law prohibits civil servants from taking part in electioneering and therefore, a chief rabbi may not take part in any activity for one party or another. This is totally absurd. Will they insist next that no one be allowed near the polling place with a Kippa because it might subliminally influence voters to vote for a religious party? Or maybe not allow women in pants near as well because that would be a subliminal message to vote for a secular party. Once we enter the fantasy world of subliminal messages, anything is possible. I suspect that the real problem here is that there are a bunch of people who are being paid to dream up trouble and they have become very good at it. That is what they would prefer. From their perspective not allowing frum Jews to vote would improve the quality of government, which is a “code word” they use for secularism. They are bigots. Anyone who is Rishon Le’Tzion shouldn’t be allowed to go outside until after the elections since the outfit reminds everyone of R’ Ovadia which will make people want to vote Shas!